Nations and peoples have always regarded food as a defining characteristic of their culture. Food celebrations (and conversely food taboos) play an important role in a people’s culture and throughout history those wishing to demonstrate power or splendour have used food to convey that. 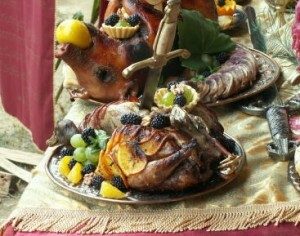 The nobles of 11th-15th century England used feasting in this way and hence the icon of the lavish banquet was born. 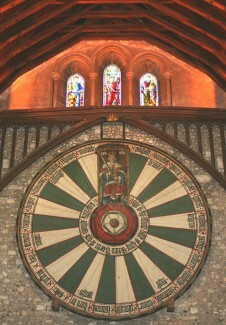 Banqueting was not just about food and drink, however. A complex ritual of other things was involved. These included ornate table layouts and menus, good table manners, service etiquette and hall decorations. Entertainment was also an important part of an enjoyable medieval banquet and included jesters, music and medieval gambling. The gourmet and alcoholic delights were just one part of what was involved! Traditionally banquets were held in the Great Hall of a medieval castle or manor house. Special guests would be seated at the high table and glass or metal goblets were used for drinking wine with tankards used for drinking ale. There were special feasts for different days in the year including Christmas and New Year and sometimes even after a special political or royal achievement. The irony about banquets during this enigmatic period in history is that we know more about them today than the average medieval ‘man in the street’ ever did. Only a relatively minor percentage of the population at that time ever attended or served at a banquet. Stories passed on by ‘word of mouth’ were the closest the common man ever got!